Preventive maintenance is the care and protection of your vehicle that help ensures unnecessary and costly repairs. Neglecting factory scheduled maintenance is the most common and costly way to see money wasted on repairs that could have easily been prevented through regular service. Depending on your vehicle’s manufacturer, avoiding preventive maintenance can void warranty coverage. Car maintenance intervals have been designed to improve the performance, reliability, and resale of your vehicle. Four County Import Service specializes in factory recommended service utilizing genuine factory parts. We service all makes and models including Toyota, Honda, Kia, Nissan, Lexus, Acura, Hyundai. 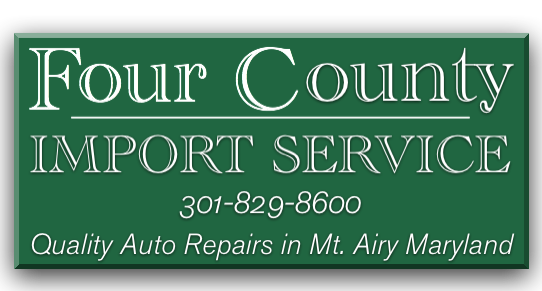 Four County Import Center serves Mount Airy, MD and surrounding areas in Montgomery County, Howard Count, Frederick County, and Carroll County with quality preventative auto maintenance. Give us a call at 301-829-8600 or stop in today!